Kristen Kieffer is the creative-writing coach behind She’s Novel, where she helps writers craft novels that will endear readers, excite publishers, and launch their writing careers. Her latest creation, The Pre-Write Project, is an epic workbook designed to help writers prep their next novel in just five days flat. Kristen loves coffee, geeking out over Tolkien, and editing her upcoming medieval fantasy novel, The Dark Between. Want to learn more? Click here! Three and a half years ago, I realized something crazy: I wanted to be a professional novelist. And once I had that dream in mind there was no going back. Ever since that fateful day, I’ve spent hundreds upon hundreds of hours reading widely, writing generously, and studying fiction like a madwoman so that one day my dream might become a reality. And all the while, I’ve focused on the one genre I knew I wanted to one day be known for: fantasy. Three years of experience certainly doesn’t make me an expert on fantasy fiction, but I have picked up a few valuable tips and tricks along the way that I wish I had known when I first began. Today, I’ll break down five of these tips and include lessons from my own experience, as well as action steps you can follow to take your fantasy novel to the next level. Ready to get started? No matter what type of fantasy you write, pre-writing your novel is crucial. The very definition of fantasy states that it includes or addresses otherworldly elements, such as magic, mythological races, or imaginary worlds. If you don’t fully understand how these otherworldly elements work in your fantasy world before beginning to write, you’ll spend countless hours struggling with plot holes, inconsistencies, and other errors when it comes time to revise your manuscript. My Experience: With my first fantasy novel, The Dark Between, I failed to explore all of the fantasy elements I planned to include before drafting. Instead, I focused solely on the elements I already had laid out in my head. By pushing these other elements aside, I ended up having to spend the first three weeks of my second draft painstakingly seeking solutions to the plot holes I had created. Action Step: Pull out a notebook and write down every fantasy element you plan to include in your novel (magic, secret societies, mythological races, etc.). Include anything you believe readers wouldn’t understand without an explanation. When you finish your list, spend as much time as you need ironing out each element’s exact details. Building a fictional world – or altering the boundaries of our real one – is always a fun process for fantasy writers, but sometimes we become so engrossed in world-building that we forget what our main focus should really be: crafting a killer story. When it comes to what readers truly want from your novel, it’s not an elaborate fictional world; it’s a story that will sweep them off their feet. Allow your fictional world to serve as the backdrop of your fantasy novel rather than the main attraction, and you will take one giant step towards achieving success. My Experience: One of the reasons it took me so long to finally complete the first draft of The Dark Between was because I spent nearly a year building my fantasy world. Yes, you read that right. A full year. Needless to say, I regret spending that time world-building when I could have been discovering my story’s incredible secrets. Action Step: Take a step back from your work and do your best to identify only the essential elements of world-building. What do readers need to know in order for your story to make sense in the context of your fictional world? If you’re struggling with this exercise, ask yourself this: “If I removed this piece of information from my novel, would readers still understand what’s going on?” If the answer is yes, then it’s time to kick that element to the curb. The Hero’s Journey is your friend. Sound familiar? The Hero’s Journey is the very plot structure used to craft famous fantasy novels like The Hobbit, Harry Potter and the Sorcerer’s Stone, Eragon, Percy Jackson and the Olympians, The Lion, The Witch, and The Wardrobe, and more. And though a few renowned fantasy novels break from this classic structure, chances are that your tale will benefit from a few hours spent getting to know The Hero’s Journey. My Experience: The Dark Between is a multiple point-of-view novel, but I utilized The Hero’s Journey to construct each character’s plotline. Using this set structure not only made the plotting process easier (goodbye Sagging Middle Syndrome! ), but it set my story up to follow the same successful pattern readers recognize and adore. Action Step: Read up on The Hero’s Journey plot structure and consider how your own story might follow its path. In a market saturated with modern fantasy fiction, it can be hard to write a novel that stands out from the crowd for all the right reasons. Recognizing this, many fantasy authors make the mistake of over-complicating their novels in an attempt to make them original. This is a huge mistake. Nothing is worse than cracking open a new novel, only to find that you can’t pronounce any of the names, visualize any of the supernatural races, or identify with any of the problems the characters face. By writing a novel that instead focuses on creating a simple yet profound connection with readers, your book will be far more likely to find success. My Experience: I have nothing against well-crafted novels with complex plots, such as A Game of Thrones or Lord of the Rings, but I’ve read so many over-complicated fantasy novels in my lifetime that I’ve made it my mission to avoid this issue in my own work. And I know that my story will benefit from it. Action Step: Take an honest, open-minded look at the otherworldly elements included in your novel. If you suspect even for a moment that readers won’t be able to pronounce, understand, or relate to one of these elements, consider giving it an overhaul or cutting it altogether. Speaking of making a profound connection with readers, the only way you’ll be able to accomplish that is to craft relatable characters your readers will adore. I’m always telling my readers to spend more time developing their characters than they think necessary. Why? Because it is their characters’ actions that make up the journey, their personalities that bring them to life, and their hearts that grip readers by the shirt collar and refuse to let go. As a fantasy writer, if you want to hook readers in for a thrilling read then you must find the heart of your characters’ stories in the midst of all the fantasy fun. Once you’ve found it, make sure that this heart finds its way to the forefront of your novel as often as possible. My Experience: I spent a lot of time world-building and plotting before I wrote the first draft of The Dark Between, but because I didn’t also develop my characters I found it very hard to write from their perspectives. As I struggled to get inside their heads, I unknowingly slowed my writing process down for months on end, not to mention that my first draft read without any sort of emotional attraction. Action Step: If you haven’t spent time developing your characters yet, take a step back and write down a list of every character whose actions affect the plot. Spend time getting to know each of these characters. Discover their personalities, goals and motivations, and the character development they’ll undergo before beginning to draft again. 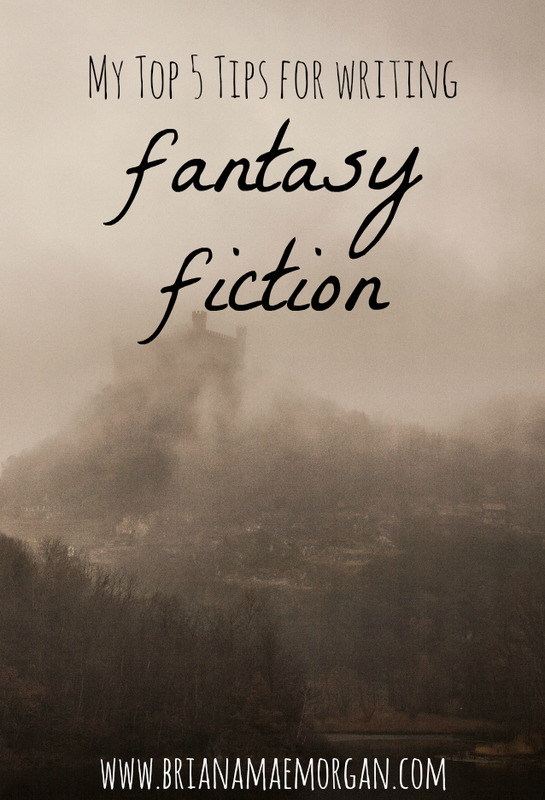 Do you have any additional tips or tricks for writing fantasy fiction? How will you take the tips we discussed today and apply them to your next novel? Sound off in the comments below!